This section shows pictures of the signs of the zodiac. They have been painted to show the nature of each sign. Captions alongside the pictures give keywords that relate to the sign. An astrologer looks at the nature of a planet in a sign of the zodiac and astrological house as well as aspects to the planet when interpreting a horoscope. Aries is the cardinal fire sign so this picture shows dynamic action. 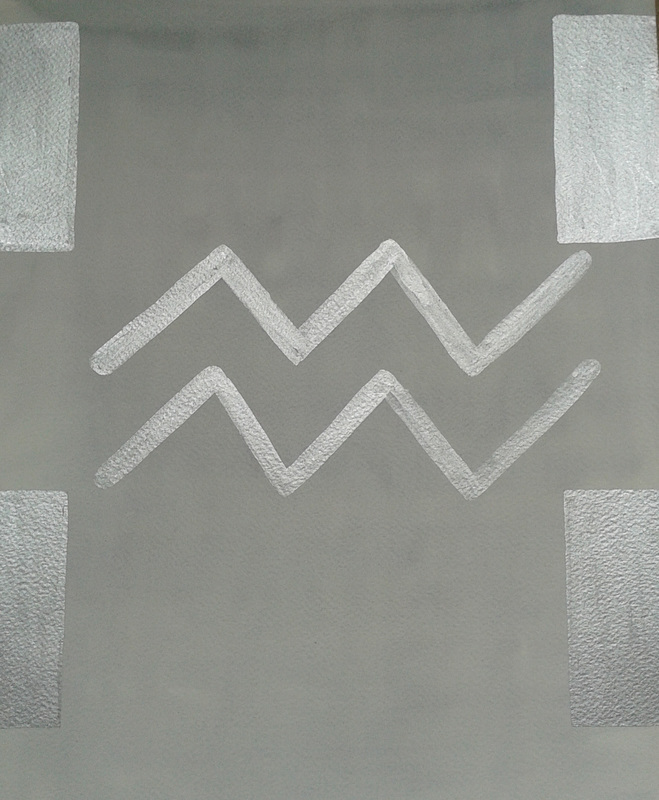 Painting the symbol of Aries in red links with the ruler of this sign, Mars, and the warmth of the fire element. Although any planet can be in this sign, the soul lesson of the Sun in Aries is love in action. Fire, enthusiasm, energetic, leadership, courage, pioneering spirit, initiates new experiences, wants immediate results, enterprising, direct, frank, candid, generous, can be passive, gentle and playful, impulsive, impatient, fiery, aggressive, insensitive to others’ feelings, selfish. Taurus is the fixed earth sign. The brown symbol of Taurus links with the earth element. The pink background links with Venus, the ruler of Taurus. The soul lesson when the Sun is in Taurus is service through love. ​Practical, serves, traditional, plodder, determined, strong, steady, constant, reliable, methodical, productive, industrious, careful, gentle, amorous, loves beauty and luxury, sense of value, likes possessions, security, protective, provider, inflexible, obstinate, cold, dry, possessive. Gemini is the mutable air sign. The multiple colours of the background represent the busy nature of this mutable sign. The silver symbol of Gemini symbolises the air element. The soul lesson when the Sun is in Gemini is brotherhood through wisdom. ​Cancer is the cardinal water sign. The pale blue-green of the background represents the water element. The strong, bold colours of the symbol represent the cardinal quality. The soul lesson when the Sun is in Cancer is peace through action. Sensitive, sympathetic, compassionate, emotional, protective, caring, nurturing, psychic sensitivity, security, shrewd, intuitive, imaginative, homely, tenacious, private, clannish, good memory, changeable, overly-sensitive, moody, sentimental, easily hurt, vulnerable, reclusive. Leo is the fixed fire sign. The bold background and symbol link with the fixed nature of Leo. The gold of the symbol and golden yellow background resonate with the radiant warmth of the fire element. The soul lesson of the Sun in Leo is love. Self expression, ostentatious, flamboyant, exuberance, warm-hearted, creative, leader, authority, courage, confident, uncomplicated, magnanimous, open, honest, out-spoken, loyal, dignity, proud, can be lazy or cowardly, egotistical, authoritarian, dogmatic, naïve, ruthless, arrogant, vain. Virgo is the mutable earth sign. The way the colours of the background merge into each other represents the mutable quality of this sign. The brown of the symbol links with the earth element. The soul lesson when the Sun is in Virgo is service through wisdom. Service to others, practical, skilful, hard-working, thorough, sensible, modest, unassuming, deeply sensitive but cool, perfectionist, eye for detail, analytical mind, shrewd, undemonstrative, shy, neat, careful, self-critical, low self-confidence, can be careless, fastidious, blinkered, critical, undermining. Libra is the cardinal air sign. The radiant pink streams in the background represent the cardinal quality of this sign that is ruled by Venus. The grey symbol links with the air element. The soul lesson when the Sun is in Libra is brotherhood in action. Fair, just, balance, impartial, arbitrator, social, integrates others, harmony, graceful, charming, courteous, aesthetic sense, modest, perceptive, mindful, democratic, tactful, cooperative, secure when needed, pleasure-loving, indecision, changeable mind, dislikes loneliness, flirtatious. Scorpio is the fixed water sign. The bold colours signify the strength of the fixed quality of Scorpio and its two rulers: Mars and Pluto. Although Scorpio is a water sign, there is nothing watery about this picture. The soul lesson when the Sun is in Scorpio is peace through love. Sagittarius is the mutable fire sign. The bold blue symbol signifies the expansiveness of Jupiter, ruler of Sagittarius. The changing background represents the mutable quality. The soul lesson when the Sun is in Sagittarius is love through wisdom. Freedom, adventure, versatile, jovial, optimistic, confident, enthusiastic, overview, expansive, exploring, open, honest, moral, truth-seeking, philosophical, tolerant, understanding, idealistic, broad-minded, good judgement, forthright, restless, boisterous, impetuous, exaggeration, tactless. Capricorn is the cardinal earth sign. The strong colours of the background represent the active energy of this cardinal sign. The structure of the picture is linked with Saturn, the ruler of Capricorn. The soul lesson when the Sun is in Capricorn is service in action. Responsible, reliable, steady, serious, disciplined, conventional, calculating, plans, organises, perseverant, hard-working, practical, status, ambitious, authority, rational, shrewd, overtly unemotional, dry sense of humour, stubborn, selfish, bigoted, severe, pessimistic, miserly. Aquarius is the fixed air sign. The grey background represents the air element. The ordered silver squares show the fixed nature of this sign. The soul lesson when the Sun is in Aquarius is brotherhood through love. Pisces is the mutable water sign. The pale colours of the background represent the water element. The way the colours change from one to another symbolises the mutable quality. The soul lesson when the Sun is in Pisces is peace through wisdom. Sensitive, emotional, vulnerable, intuitive, compassionate, kind, adaptable, chameleon, gentle, quiet strength, loyal, freedom, easy going, trusting, profound inner life, imaginative, dreamy, changeable, weak will-power, indecisive, impractical, poor sense of individuality.